We’ve put each XC6 ultra-rugged tablet model through rigorous challenges and tested to MIL-STD-810G and IP67 standards – and beyond – to ensure it thrives in hazardous locations and factory environments alike. The XC6 tough mobile computing platform is offered in five different configurations to suit the individual requirements of your business, and every one of the models boast the same ultra-rugged chassis, high-performance processing core, and durable mobile computing experience. No matter which XC6 model you choose, you’ll reap the benefits of the most rugged tablets on Earth. Experience one for yourself. When downtime is not an option, the XC6 series offers a tough tablet PC for your specific workflow. From clean rooms to Hazardous locations you will find an XC6 rugged tablet model that performs and addresses the challenges facing your team. 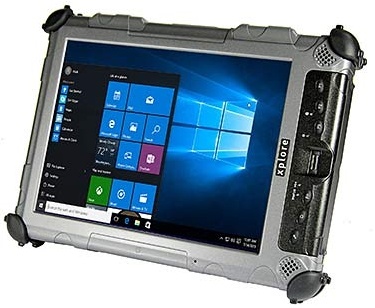 The Most Rugged Windows® Tablet on the Market: Xplore's XC6 DMSR ultra rugged tablet PC is the ideal mobile computing platform for demanding industrial and outdoor environments. Powered by a 4th Gen Intel® Core™ i5 processor, this high-performance ultra-rugged tablet makes running your toughest applications easier than ever- no matter how extreme the environment. It features a direct sunlight readable resistive multi-touch display that supports gloved touch interface. Hazardous chemicals, high heat and dust storms won't slow down, much less stop, the XC6 DMSR ultra rugged tablet PC. Your teams' mobile strength and security won't be challenged by their environment with this fully submersible and field repairable tablet PC. Ultra Rugged, Dual-Mode, Industrial Mobility: Xplore's XC6 DM and DML ultra rugged industrial tablets offer the same durability as other XC6 models, but at a lower cost. The Xplore XC6 Dual-Mode and Dual-Mode Lite rugged tablet PCs are optimized for indoor industrial work with a glove touch display suited for ambient lighting conditions. The XC6 DML tablet is the lowest priced rugged tablet PC in the XC6 series. This durable tablet model uses an Intel® Celeron Dual Core processor- perfect for running less data-intensive applications. • Optimized for Rugged Indoor Environments – Multi-touch resistive display works with gloves and while soaking wet. When work has to get done and downtime is not an option, keep your factory humming with the XC6 DM and XC6 DML ultra rugged tablet PCs. ?Dual-Mode, Clean Room - Contamination Free: This tough mobile computer is optimized to prevent contamination, pooling, and particulate matters in clean room operations. Personnel working in industrial Clean Room environments need computers that can deliver superior results, and meet the strict requirements of clean rooms. The XC6 DMCR protects against the ingress of contaminants and cleaning solutions, random vibrations, temperature extremes, and more, to provide superior mobile computing performance under the most challenging workplace conditions. • Field-Proven Rugged Tablet Designs - Flexible user interface with an innovative auto-switching digitizer pen supports both glove-touch and active pen inputs. Custom docking options and an attached handle enable specialized portability for Clean Room environments. • Total Control of Ownership - One of the best clean room rugged tablets for a long, stable lifecycle. Backed by a proven track record of high reliability with low failure rates. User-accessible bays allow for in-field upgrades and repairs. Critical work is being conducted behind the closed doors of laboratories and other clean room sites worldwide. Whether your research and development efforts are being driven by a chip manufacturer, government agency, biotechnology program or healthcare organization, Xplore's tablet PCs can protect the data, driving you towards a positive outcome. Xplore XC6 Series Windows Mobile Computer Tablet Clean Room xDock Cradle for XC6 - Clean Room xDock Cradle for XC6 DMCR rugged tablet and xDIM docking interface module (Hardware kit included). 1-year limited warranty.